Imagine Carmen Miranda’s fruit filled hat. Then imagine preserving it. That’s pretty much how it all started. There was a large display of champagne mangoes at Whole Foods. And beyond the mangoes, there was a cart, big and wooden, with a tent shaped roof. All the tropical fruits were displayed there. Coconuts, pomelo, small extremely sweet bananas, grapefruit, papaya, green skinned mangoes, melons of all sorts, blood oranges and Ugli fruit. It was like cruising the breakfast bar at Club Med. In the 1940s, when bananas were the first mass market tropical fruit imported, the famous (ear-wormish) Chiquita banana song was aired to help people learn how to eat and keep bananas. Nowhere in this jingle is there anything about making preserves, but it’s still utterly charming. This is the first year I even thought about exotic fruits and preserving and I have no idea why. The flavors just haven’t been in my preserving wheelhouse up to now. Perhaps it’s this odd weather and the non-winter and every single blooming thing in my yard in full color in one moment. It all has me thinking in the colors of papaya and melon, mango and limes. I’ve been craving fruit. This was inevitable. Naturally, I turned to the oracle – Christine Ferber – and four preserves emerged – different than anything else on my shelves. If you have never thought to capture the flavors of the tropics, give it a try. I am thoroughly delighted with the variety and they all seem to scream out for ice cream or ricotta or cottage cheese. The mango preserves is heavenly, and so true to flavor, I need yogurt only as an excuse to eat this sweet, exotic pleasure on a spoon. The mango papaya is sort of marmalade-ish, very lime flavored. I tried a different technique, blitzing the lime peel with the sugar, so small pieces of lime float all through the jam. It’s bitter and sweet and complex, with spices and booze. I’m calling it MaiTai Preserves. The pineapple is suspended in a rum syrup crying out for layers of light as air coconut cake. Holy cow, is it fantastic. And the mango with banana? 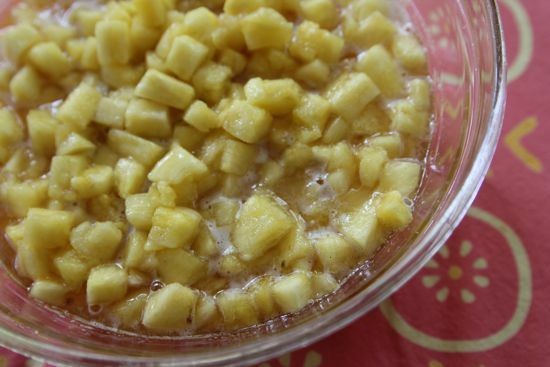 Different than anything I’ve ever made, a little too sweet for my taste, but poured warm over ice cream it will make for a crazy good, tropical fruit sundae. These are fun flavors, very small batch jams, adapted from or inspired by Mme. Ferber, and exotics fruits are in stores now. In most cases, a small batch will be just enough. But the MaiTai preserves? Ai, carumba! as Carmen would say, I’ll be making another batch of that one soon. The technique is essentially the same for each. Macerate the fruit, sugar and lemon juice overnight. Strain out the fruit and bring the syrup to 218°F in a heavy large pot. This will take about an hour. Add the fruit to the syrup. Bring the jam back to a boil for about ten minutes, until the foam has cleared and the jam sheets off the spoon. To clear the last of the foam, add about 1/2 tsp of butter, stir well. Ladle the preserves into sterile jars, leaving 1/4″ headspace. Process for 10 minutes in a boiling water bath. Peel and dice the mangoes. 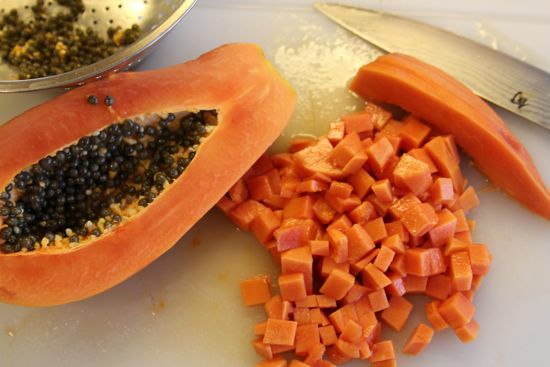 Peel, seed and dice the papaya. Stir together in a large glass or ceramic bowl. 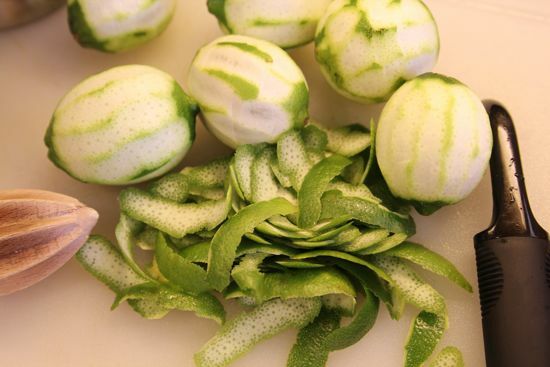 Remove the peel, not the pith, from the limes using a vegetable peeler. Add the peel and one cup of sugar to the food processor or blender and blitz the bejeezus out of it until the lime is distributed throughout the sugar. Take a whiff. It smells amazing. Add this sugar, and the remaining three cups, to the papaya and mango. Juice the limes. Add the lime juice, ginger confit and rum to the fruit mixture. Crush the coriander and black pepper under the blade of your knife and add to the fruit. I tried toasting the spices, but prefered the flavor untoasted. Cover with parchment, then plastic wrap, and refrigerate 8 to 24 hours. It will take about ten minutes until the fruit and syrup combine. Stir stir stir. The bubbles will change, and the mixture will go from very foamy to bubbles that burst slowly to reveal clear preserves below. When the jam is ready, remove from the heat and stir in 1/4 tsp of butter, to remove the remaining bubbles. Ladle into sterilized jars, leaving 1/4″ headspace. Process in a waterbath for 10 minutes. To assess the ripeness of your pineapple, tug at the large leaf. It should pull away like an artichoke leaf, with a slight tug. Smell the pineapple. It should smell sweet and fruity. There should be no green, or very little, on the outside of the fruit. When ripe, they turn golden. Hack off the top leaves and cut the bottom to make a flat surface. Using a large, sharp knife, slice away the outer roughness. Cut in half lengthwise, then in half, the long way, again. Remove the tough core and cut out any brown *eyes* on the outside. Now dice the fruit. 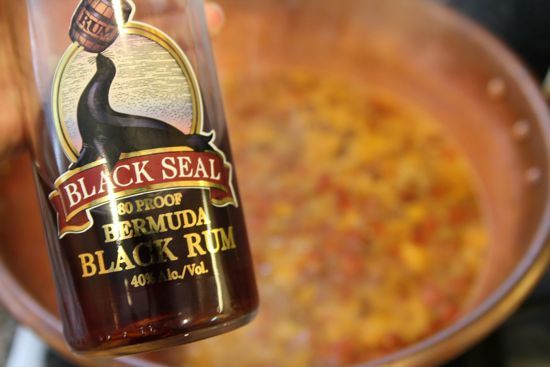 Stir the fruit, rum, vanilla and lemon juice together and allow this mixture to macerate overnight. Mme. Ferber suggests ceramic, but glass bowls are perfect. Cover with parchment, then plastic wrap, and refrigerate 8 to 24 hours. Stir in the sugar and lemon juice. I need to find some of those champagne mangoes; you’ve mentioned them before and I’m intrigued; maybe mostly because basic mangoes do nothing for me. But this group of concoctions…especially the one with rum? Umm umm good. Please try mangoes again. They must be ripe, and should smell wonderful before you even cut them open. I am all over these new recipes! 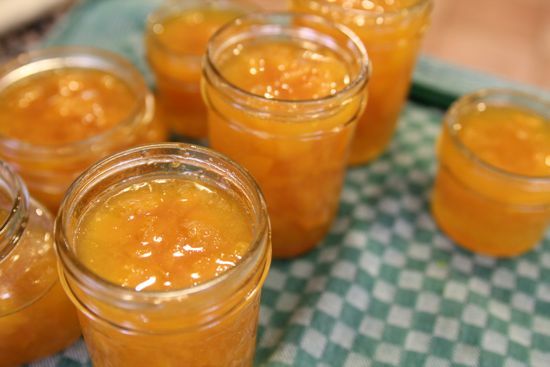 Mango tops the list, then Mai Tai – it never entered my mind to make tropical jams, despite my love of tropical fruit! One year when my daughter was 7 or 8 she dressed up as Carmen Miranda for Halloween. She did a fantastic job with her costume, even our local little newspaper ran a picture of her. 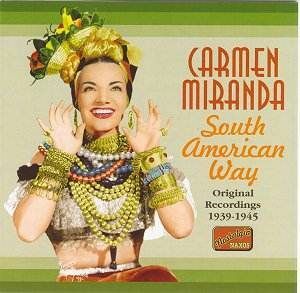 But I was shocked, SHOCKED, that no one knew who Carmen Miranda was. Is my age showing? You know, Elyse, I wondered if I was digging too deep in the memory garden… I’m glad you know Carmen. And your daughter does, too, for that matter. Carmen’s turban, catchy tunes, and tropical goodness in a spoon! you might just have crossed the line Madame Brouette and created a new push to the canning movement- costume preserving & dancing classes. I’m in! P.S. any advice from Christine Ferber- la Reine des Confitures is like gold! It’s making me want a soundtrack for all my canning adventures. I’m a chiquita banana and I’m here to say I am the best banana in the world today!!!!!!! Just starting to can and the mai tai preserves sound amazing. I’m confused, though, where’s the rum in the recipe? Love your recipes, and the incredibly welcoming site. Wow. Good catch. 🙂 I’ve added it in. Thank you! It’s my maiden voyage in canning and I have no instinct to guide me! Great post Cathy! I adore Feber, she is my jam goddess hero..her techniques are the very best. Love the MaiTai recipe with the added coriander (wow!). I have been experimenting with Plaintains and Cashew Fruit–when I perfect, I will post something up. Wendy, I was thinking about you the whole time I was making these jams. I wondered if you had long seasons of tropical fruit in your grocery store? Where up here in the mid-Atlantic, we have it only for about six weeks, except for occasional bursts of pineapple or green skinned mangoes. Giving a shout-out to guava! If you ever see even a couple of ripe ones, grab ’em. They’re easy to process (wash, slice, cook in water til soft, put through a sieve), full of pectin, and just a little bit will add a lot of flavor. Guava-strawberry jam is da bomb! Oh, Heidi… I wish! I was looking for passion fruit and for guava and neither was available fresh. So sad! This is right up my alley! Thanks so much for this post. I’m going to try them all, and the Chiquita banana song is the best! looking forward to testing out the Pineapple Rum Preserves! Can you tell me how many pints to expect? About three half-pints. I ended up with one 12 oz jar and one 8 oz jar. PS I think I set aside at least 4oz, just for, um, tasting…. i love the instruction in the maitai preserves to smell the sugar after it’s blitzed with the lime peel. as though i wouldn’t! ;-o) i’m digging into the ginger confit tomorrow and should have the preserves on deck by this time next week. sayonara! I just used the last jar. I have to make more! Cathy, your instructions are fantastic! 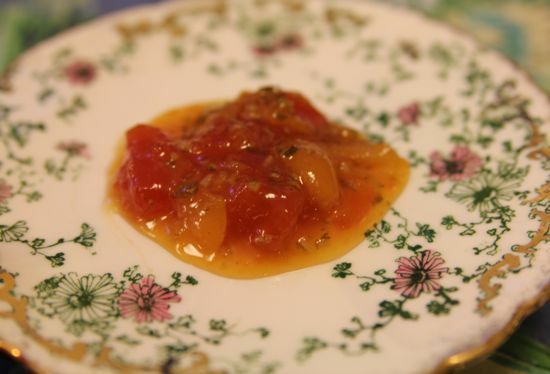 I made the Mai Tai preserves today, and they are delicious–and beautiful. I’ve been reading up in all kinds of canning books, and your directions are by far the most helpful. Thank you so much. Thank you Jennifer! You made my day! You know, you were posting this while I was in Hawaii. And my favorite part of Hawaii is raiding the breakfast buffet for the all u can eat papaya – my fav fruit in the world!! You might just make a canner out of me Cathy! Brilliant ideas! i just finished prepping everything for the maitai. i smell fantastic! don’t see where the rum is supposed to go (into the cook . . . . ??? ), so i’m putting it in with everything else. then i’m gonna put a straw in it . . . nice knowin’ ya! Oh, oops. I fixed it. Rum into the mixture, just as you would suspect. But a little for the cook never hurt. Am I reading this correctly –it will take an hour for the the syrup from the champagne mangoes to reach 218? Or does it need an hour once it hits 218…? These look absolutely delicious –I think I’m going to work my way down the list…! This recipes are right up my street. I’m home in Nigeria where fruits abound and are a dime a dozen. I’ll have to make my ginger confit first :-), you have me hankering after the MaiTai….and I better hurry up as Mango season will soon be over! Thanks. I think I’m a little jealous! Do try the pineapple rum, if you don’t have time to make the ginger confit… it’s ridiculously wonderful. These look fantastic! My neighbor and I have been canning mangos like crazy as 2 trees on the property are just going off. (i live in honolulu.) Next are three loaded papaya trees. I have never really canned before and it has been epic. Finished mango butter this morning, must finish some chutney just started, then maybe the Mai tai thing which will be a winner for gifts , I still have tomorrow off. Crazy weather has set fruit on these trees which have never produced that much before. Thanks so much for the lovely recipes. Ok so I am relatively new to canning and being a tropical girl these fruits are in abundance here , Do none of these recipes require pectin? Or am i missing something? None of them require pectin! I have been making Mango Saffron and Mango Coconut Lime. YUM! I need help…. I’m an expat, living in Nicaragua, and I’m going to try all of these, but what I really need, is something for my passionfruits. The vines went wild this year, and I have literally, HUNDREDS!!! and I can only drink so much juice….. any ideas???? I would deeply appreciate it!!! What a delicious dilemna. We never see passionfruit here, so I haven’t done any preserving with it. Why not try using the mango preserves ratios and sub passion fruit. See how it goes! And please let us know. pineapple-rum preserves update: i just finished prepping a 3x batch. fyi: the recipe doesn’t indicate the addition of sugar. i love the maceration step with this recipe and the mai tai preserves — that step really improves the structure of the finished product. i decided to do the recipe without vanilla, since it seems like the base can go in so many directions. i’ll add vanilla bean paste to some of it; ginger-onion-cumin-jalapeño-macadamia nuts to some of it (maybe with a hit of balsamic reduction); and my scarborough fair herb blend to some (and i’ll call that “simon & pineapple”). many thanx for all you do to help me look fantastic! Canning, pickling and preserving are my new hobbies. I’m a bit obsessed with it, to the exclusion of all else. I’ve put up over 75 farms in the space of three weeks; prolific, considering the size of my entry level canner. I was SO excited to see Cathy’s tropical recipes! No other flavor pallet can cool me down in summer and bring ocean breezes to a dull winter. 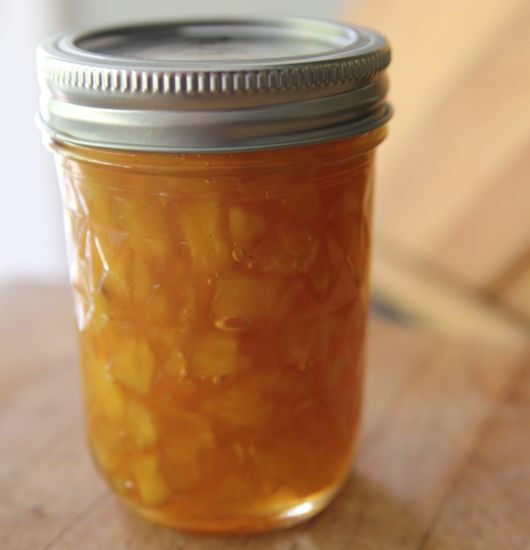 I kind of mixed and matched several, of your recipes, Cathy, and, using your mango preserves recipe as a base, came up with a mango, pineapple, coconut and rum preserve. Delish! Change out some sugar for vinegar and this would make a lovely chutney! Having a manic personality can sometimes be a good thing! Bought tons of fruit from the discount table…and I mean tons! Decided to make my version of the Maitai preserves….adding in apples, pineapples and grapes….but no papaya. Just finished canning 26 jars. I already have friends list ingredients up for their jar! Thanks so much for the amazingly delicious recipes! A lovely profile on food52.